We have been licensed by Kent County Council to hold marriage ceremonies. This can be conducted inside in a specified area or outside under our gazebo (weather permitting). We can cater for up to 80 guests for a seated reception. 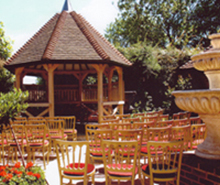 We have avaliability for a limited number of Weddings or large celebrations each year. We have to limit this due to restaurant bookings. We only cater for Weddings at present using our Full Wedding Package. Our Wedding package starts from £6500 for 60 minimum day guests (with a 3 Course Meal and Drinks Package) with an extra 80 guests in the evening thus providing a finger buffet for 140. Day guests can be increased by 20 guests priced accordingly. All drinks extra to the package are to be purchased from our bar. If you would like to hold your legal ceremony with us this is booked through ourselves at the rates set by Kent County Council as an extra to the above costings. Please ask for our detailed Wedding booklet for further information. The Hilltop can provide a flexible venue for your meeting purposes. please contact us on 01732 822696. Please note we sometimes hold late functions, particularly on a Friday evening, that leaves our rooms unavailable for occupation, this will be explained if relevant to your stay. We can provide a large table of 26 maximum but on limited occasions as we try to keep our venue to a restaurant facility.